Signed by the Miami Marlins as a non-drafted free agent out of the Dominican Republic on Nov. 2, 2012...signed by Marlins scouts Albert Gonzalez, Sandy Nin and Domingo Ortega...Acquired by Houston at the 2014 trade deadline in a seven-player swap that sent RHP Jarred Cosart and Kiké Hernandez to the Marlins...in addition to receiving Martes, the Astros also acquired OF Jake Marisnick, IF Colin Moran and a 2015 Competitive Balance Round A pick, which turned into outfield prospect Daz Cameron...Moran has since been traded to Pittsburgh in the Gerrit Cole trade, while Cameron went to Detroit in the Justin Verlander deal...Was added to the Astros 40-man roster upon being selected to the Major League roster on June 8, 2017. Had an injury-plagued season, which cost him all but five minor league starts and 19.2 innings pitched in...began the year at Major League Spring Training and impressed, posting a 3.38 ERA (5ER/13.1IP) in five games (three starts) with the Astros...optioned to minor league camp on March 18...broke camp in the rotation with Triple A Fresno and made five April starts...shut down after a start on April 29 and did not pitch in a game for three months...returned to the mound on a minor league rehab assignment with the GCL Astros on Aug. 2 and pitched 1.0 inning in a start...was shut down for the season after that, eventually undergoing right elbow ulnar collateral ligament reconstruction surgery on Aug. 15...at the time of his surgery, was expected to be out 12-16 months. Made his Major League debut, appearing in 32 games and making four starts for the Astros...struck out 69 batters in his 54.1 innings pitched...spent the season as a 21 year old, making him one of the youngest pitchers in the Major Leagues...was the youngest AL pitcher to make a start during the 2017 season...posted a 27.7% strikeout rate...only one pitcher in club history posted a higher strikeout rate at as young of an age as Martes: RHP J.R. Richard in 1971 (30.2% strikeout rate at 21 years old)...went 2-0 with a 4.08 ERA (8ER/17.2IP) in his four starts (June 14-July 1)...held opponents to a .238 batting average in those games, with the club going 4-0...in 28 appearances out of the bullpen, posted a 3-2 record with a 6.63 ERA (27ER/36.2IP) and 48 punchouts...averaged 95.6 miles per hour on his fastball and threw his slider on 37% of his pitches...was at Major League Spring Training as a non-roster invitee...began the season with Triple A Fresno before getting selected to the Major League roster on June 8... made his Major League debut on June 9 vs. LAA...pitched 3.2 innings, giving up four runs on four hits in 3.2 innings...struck out two and walked two on 78 pitches...marked the third-most pitches thrown by an Astros reliever in his Major League debut, and the most since RHP Wilton Lopez threw 92 on Aug. 28, 2009 at ARI...at 21 years, 197 days old, was the youngest Astros pitcher to make his Major League debut since RHP Jordan Lyles on May 31, 2011 at CHC (20.224)...became the youngest AL pitcher to make his MLB debut since RHP Luis Severino debuted for the Yankees on Aug. 5, 2015 vs. BOS at 21.166...made his first Major League start, in what was his second career appearance, on June 14 opposite the Rangers...held Texas to one run on three hits over 5.0 innings, fanning seven in the Astros 13-2 win...became the first Astro to strike out seven batters in his first start in the Majors since LHP Carlos Hernandez did so on Aug. 18, 2001 vs. PIT...at 21 years, 202 days old, Martes became the youngest Astros pitcher to earn a win since RHP Jordan Lyles (20 years, 305 days old) on Aug. 20, 2011 vs. SF...marked his first win of the 2017 season, including his eight starts at the Triple A level...marked his first professional win since Aug. 26, 2016, while pitching for Double A Corpus Christi in a start vs. Midland...on July 19 vs. SEA, pitched the final 2.1 scoreless innings vs. MIN...fanned five batters, which marked his most strikeouts as a reliever in a single outing...had two streaks of four scoreless outings from July 15-25, and Aug. 15-24...made eight starts at Triple A before being called up to the Astros...went 0-2 with a 5.29 ERA (19ER/32.1IP) and 38 strikeouts. Completed his second consecutive full season in the Major Leagues, playing in 118 games and making 85 starts (60 in center field, 22 in left field, three in right field) ...recorded a career-high nine outfield assists...posted a .995 fielding percentage, as he made just one error in 213 total chances...ranked third among AL outfielders in fielding percentage (min. 750 innings)...also ranked seventh among AL outfielders in defensive runs saved (18)...recorded a career-high 18 doubles...made his second career and second consecutive Opening Day roster...had a brief stint at Triple A, as he was optioned on April 24 and recalled May on 5...missed four games with a right groin injury from Aug. 12-15...had his best month of the season in July, as he hit .326 (15x46) with an .819 OPS (.340 OBP/.478 SLG) in 20 games...recorded a hit in nine consecutive home games from July 27-Aug. 26, batting .310 (9x29) during the run...was a career-long streak...hit .185 (5x27) during his seven-game stint at Triple A. 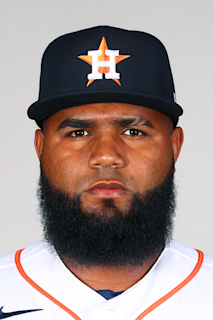 March 28, 2019 Houston Astros placed RHP Francis Martes on the restricted list. March 6, 2019 Houston Astros optioned RHP Francis Martes to Round Rock Express. October 1, 2018 Houston Astros recalled RHP Francis Martes from Round Rock Express. August 2, 2018 Fresno Grizzlies sent RHP Francis Martes on a rehab assignment to GCL Astros. May 4, 2018 Francis Martes roster status changed by Fresno Grizzlies. March 18, 2018 Houston Astros optioned RHP Francis Martes to Fresno Grizzlies. November 2, 2017 Francis Martes roster status changed by Houston Astros. October 5, 2017 Houston Astros reassigned RHP Francis Martes to the minor leagues. June 8, 2017 Houston Astros selected the contract of RHP Francis Martes from Fresno Grizzlies. April 4, 2017 RHP Francis Martes assigned to Fresno Grizzlies from Corpus Christi Hooks. January 13, 2017 Houston Astros invited non-roster RHP Francis Martes to spring training. May 28, 2016 Corpus Christi Hooks activated RHP Francis Martes from the temporarily inactive list. May 24, 2016 Corpus Christi Hooks placed RHP Francis Martes on the temporarily inactive list. August 24, 2015 RHP Francis Martes assigned to Corpus Christi Hooks from Lancaster JetHawks. July 20, 2015 RHP Francis Martes assigned to Lancaster JetHawks from Quad Cities River Bandits. May 19, 2015 RHP Francis Martes assigned to Quad Cities River Bandits from GCL Astros. July 31, 2014 Houston Astros traded RHP Jarred Cosart, LF Enrique Hernandez and OF Austin Wates to Miami Marlins for CF Jake Marisnick, 3B Colin Moran, RHP Francis Martes and . July 31, 2014 RHP Francis Martes assigned to GCL Astros. June 20, 2014 RHP Francis Martes assigned to GCL Marlins. November 2, 2012 Miami Marlins signed free agent RHP Francis Martes to a minor league contract.